This is the third game in Svea Rike series. The year is 1275, and the Nordic countries are the battlefields for the fight for the throne. Your goal is to take one of the three playable nations (in six fractions), Denmark, Norway and Sweden, and by the end of the game put the crown on your head. The basic game play revolves around upgrading the infrastructure of your cities, keeping your population happy, and obviously waging war with your neighbours and expanding your territory. Translated to English in 2003, a bit of patches applied, cleaned up, it was sold as Crown of the North. Note the American edition exists only as a ‘pack’. 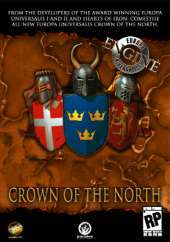 Wrapped with Europa Universalis II and sold as Europa Universalis: Crown of the North.